Scandal around 3DMark03: what happened? First of all, today we will test two Hercules cards: the weakest one in 3D among the cards of this company, and the strongest one. After that we will try to look into the problem around FutureMark 3DMark03. 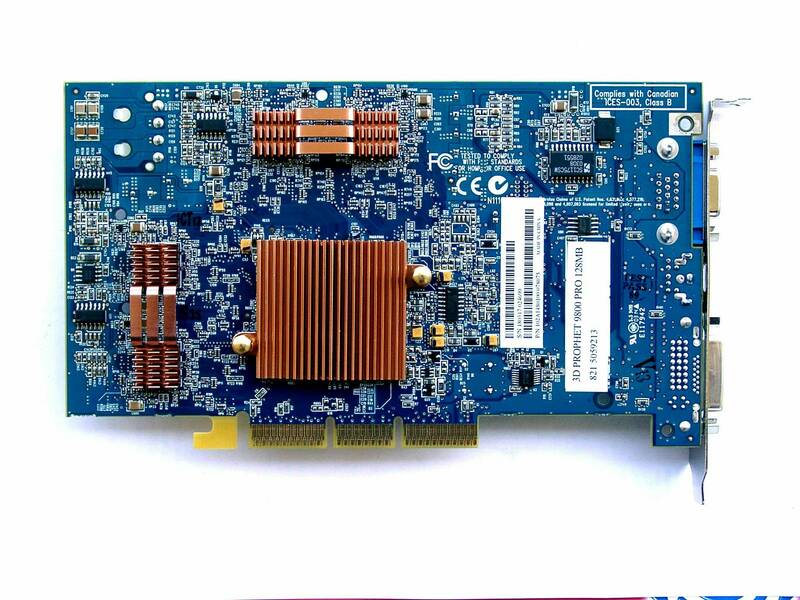 Almost the strongest ATI's accelerator, RADEON 9800 PRO 128MB, has already reached our market. Why almost? 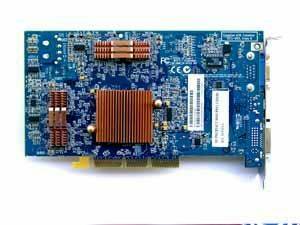 The RADEON 9800 PRO 256MB DDR-2 is considered to be and it actually is the most powerful accelerator today. The first samples are also available already, and soon such pilot balloons will be tested in our lab. 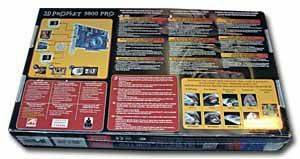 The RADEON 9800 PRO 128MB is very pricey, it starts from $450. 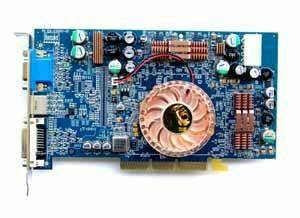 Well, not so long ago people turned up their noises at such prices for GeForce2 Ultra, and those cards were selling with great difficulty. Today High-End 3D accelerators nicely live in the price range over $400. 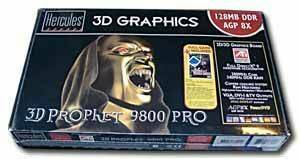 I hope it won't last forever: some time ago the RADEON 9700 PRO was priced at $420-450, and today you can find it at $260. 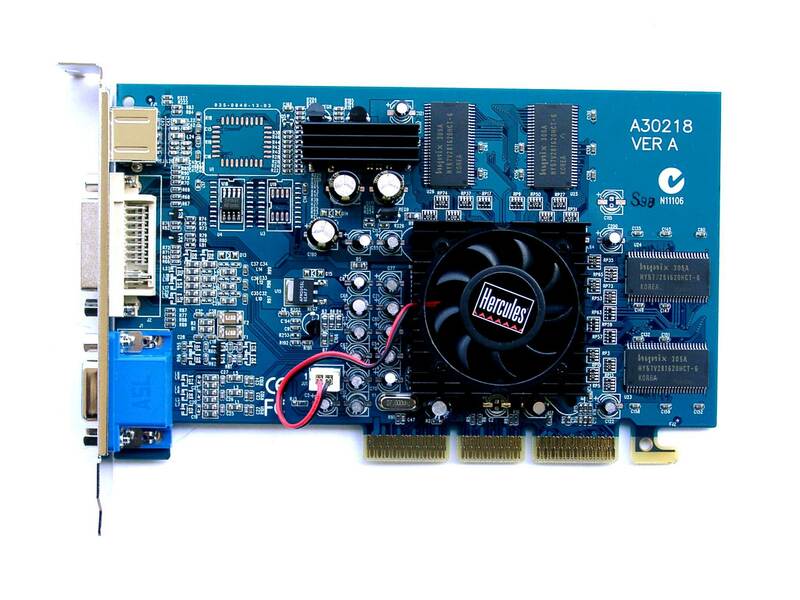 Hercules is the oldest videocard maker (though it changed much since 1999 when the bankrupt company was taken up by Guillemot). The good old Dynamite and Terminator trade marks sank into oblivion, and now Hercules's cards are produced under the 3D Prophet trade mark (earlier this mark belonged to Guillemot). But Hercules' quality is still the highest today. Although the most part of cards are produced by its partners, each card is then carefully tested by the guys from Hercules. Besides, the company never just buys & rename OEM products. All Hercules cards are unique - the company either produce them itself or places orders with third parties. 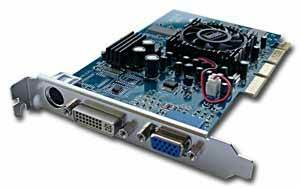 The RADEON 7500 is something like a Low-End solution among ATI GPUs based cards. 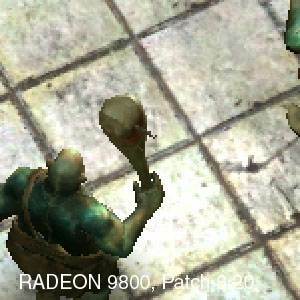 Even the RADEON 9000, a more powerful processor, is not dearer than $60. 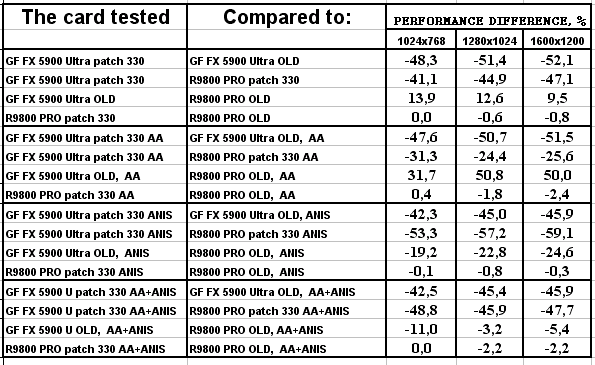 The question is why the company keeps on producing such cards if there is almost no demand because the RADEON 7500 is very weak by the latest standards (only DirectX 7.0 is supported)? 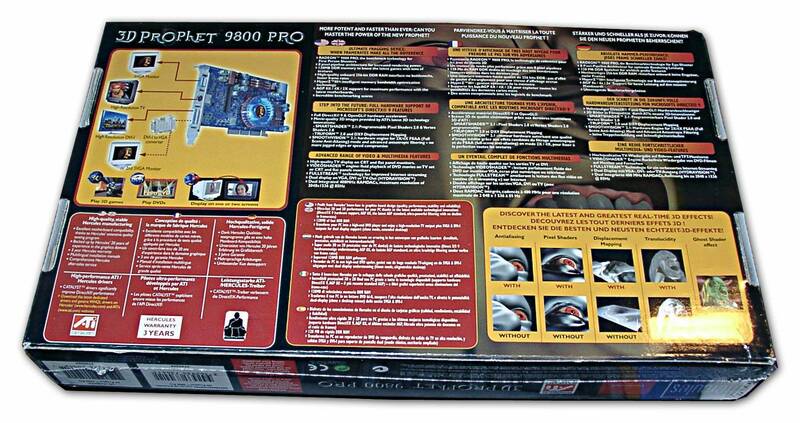 The answer is written on the box: this is primarily a budget accelerator with the dual-monitor support (i.e. it can display images either on two monitors or on a PC monitor and a TV screen). 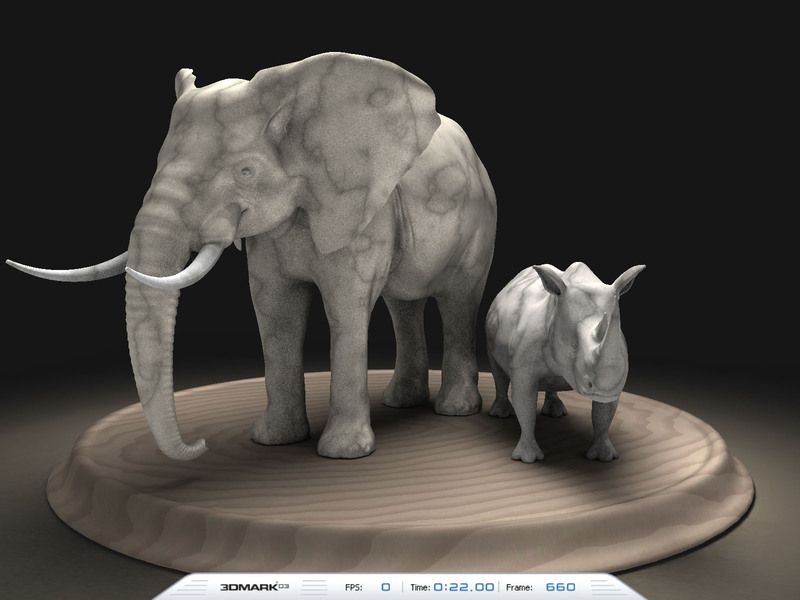 3D functions are added as a bonus. 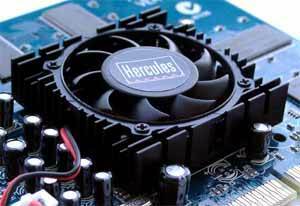 The RADEON 7500 presented by Hercules is a kind of a modern RADEON VE (7000) with rich multimonitor capabilities but scarce 3D functions. As to the flagship, RADEON 9800 PRO, I adore this super-card! 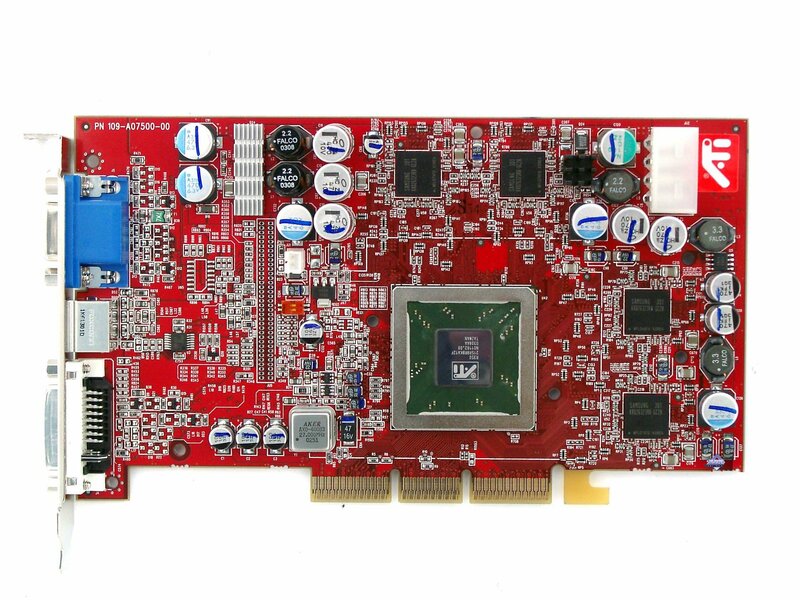 The card has AGP x2/x4/x8 interface, 128 MB DDR SDRAM in 8 chips on both PCB sides. 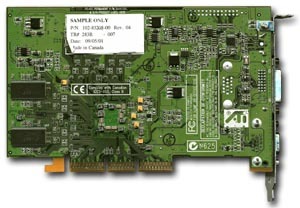 256-bit memory interface. 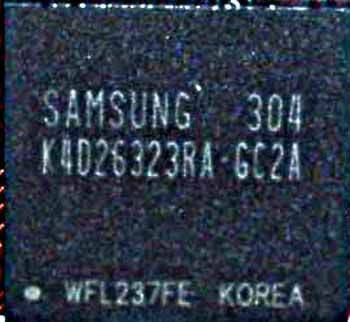 Samsung K4D26323RA-GC2A, BGA form-factor. The highest clock speed is 350 (700) MHz, 2.8 ns access time. 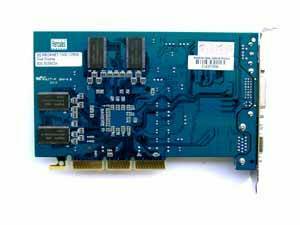 By default the memory works at 340 (680) MHz, the chip at 380 MHz. 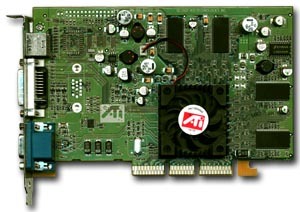 The same 128 MB DDR but 128bit memory, AGP X2/X4 interface. 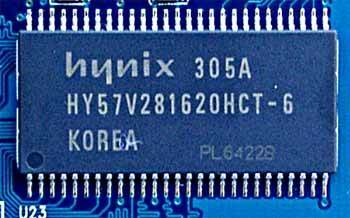 Hynix SDR(!) memory chips, 6ns access time, it corresponds to 166 MHz, the memory works at 166 MHz, the core at 250 MHz. 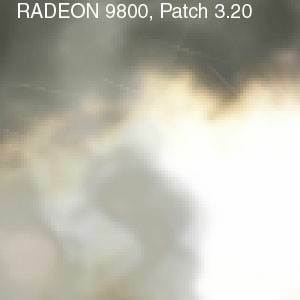 The card based on the RADEON 9800 PRO is a copy of the reference sample, only the color is sky blue. 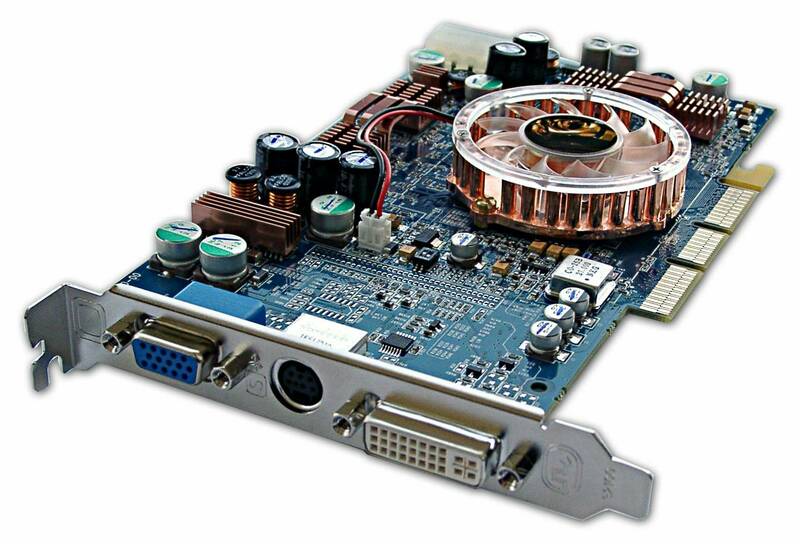 The card built on the RADEON 7500 has a unique design, simpler than the reference one (actually it should be expected from a budget solution). As to coolers, the one attached to the Hercules RADEON 9800 PRO looks really interesting. The cooler is similar to that attached to the Hercules RADEON 9700 PRO card, only the fan is not of the copper color, it's semitransparent, and when the computer works the LEDs create a very impressive effect. 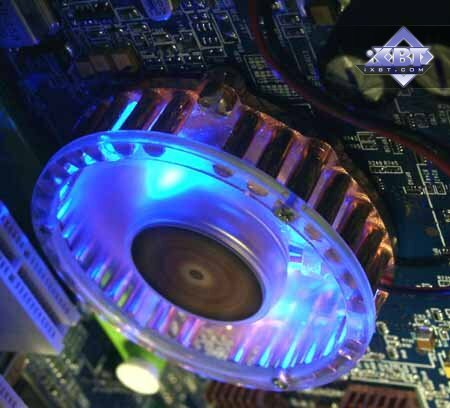 However, processors on video cards usually face downwards today. This is a simple cooler with a fan attached with thermal grease. 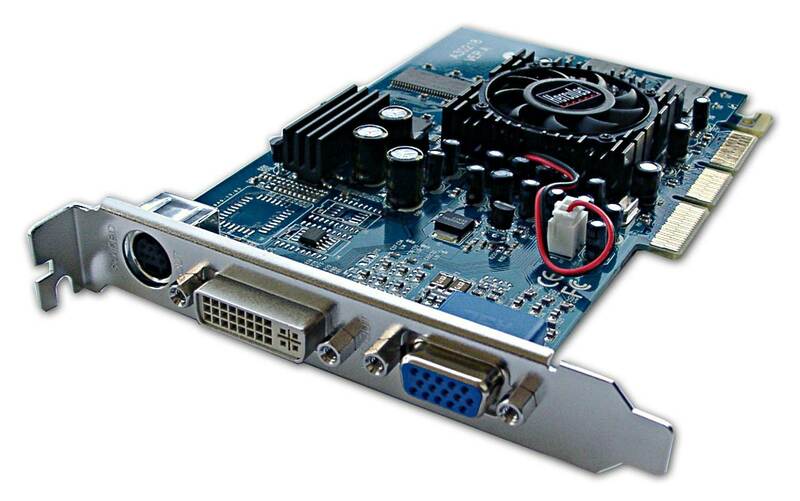 The RADEON 7500 is not of much interest, but it we take off the RADEON 9800 PRO, we will see the GPU R350 itself. 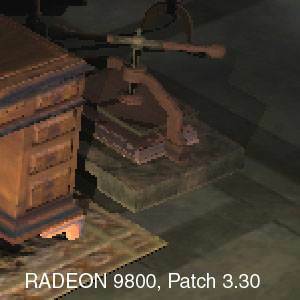 I must say that the RADEON 9800 PRO has actually two coolers. 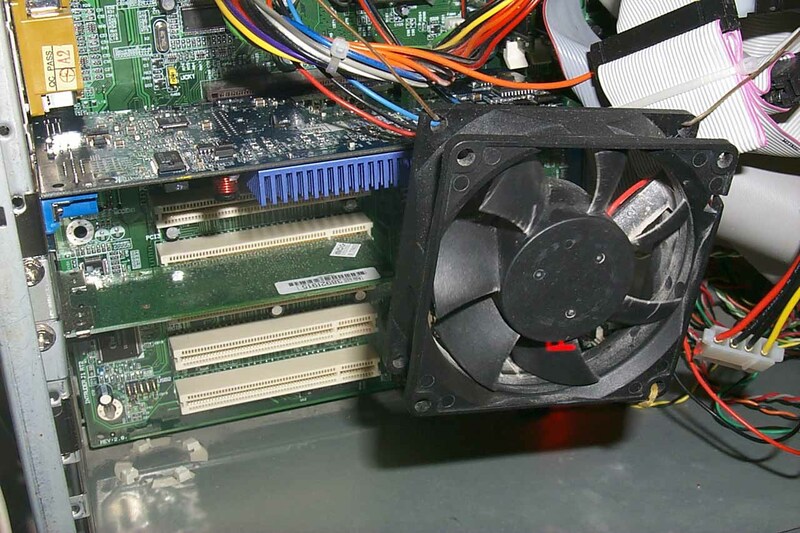 The second one is located on the back of the card - this is a heatsink for cooling down the processor underneath. Both devices are reliably joined with bolts. And each pair of the memory chips have copper heatsinks which are attached with thermal grease. 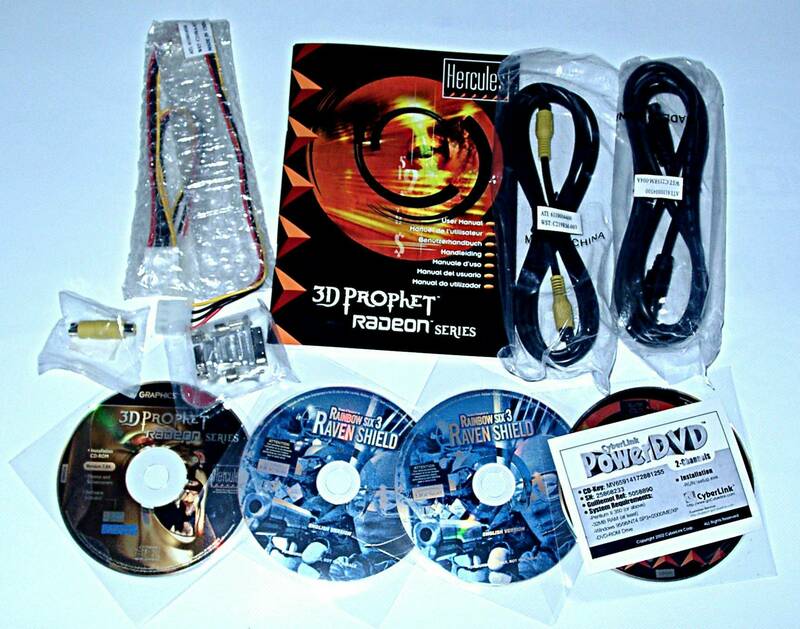 User Guide, CD with drivers and utilities, CD with Rainbow Six 3 game, and PowerDVD, S-Video-to-RCA and DVI-to-d-Sub adapters and TV-out extenders. 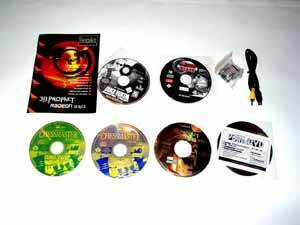 User Guide, CD with drivers and utilities, PowerDVD XP, CDs with games, TV-out extender, DVI-to-d-Sub adapter. Both cards ship in retail packages. Also a mythical creature but the face is not that ugly :-). The box is of the style of all latest Hercules solutions. 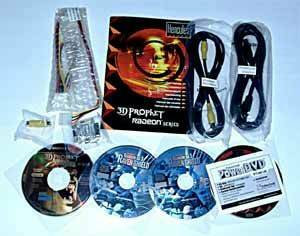 Hercules 3D Prophet 9800 PRO 128MB 380/680 -> 450/760 MHz - excellent!. 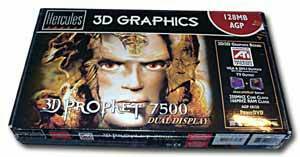 Hercules 3D Prophet 7500 128MB It wasn't overclocked since it's not needed for a budget solution. 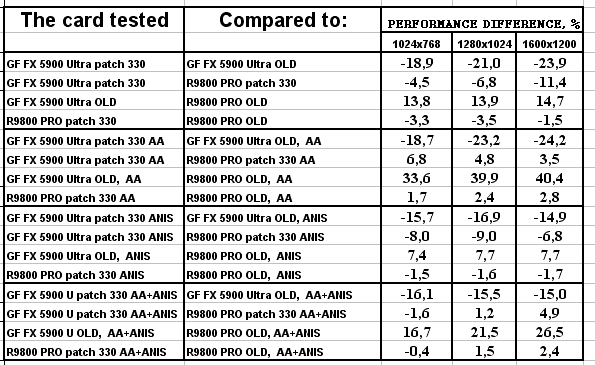 Overclocking depends on a certain sample, and you shouldn't extend single-card results to the entire series or trade mark. 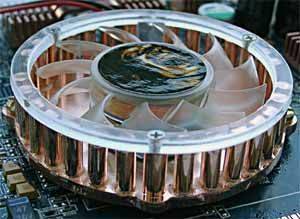 Overclocking results are not obligatory characteristics of video cards. 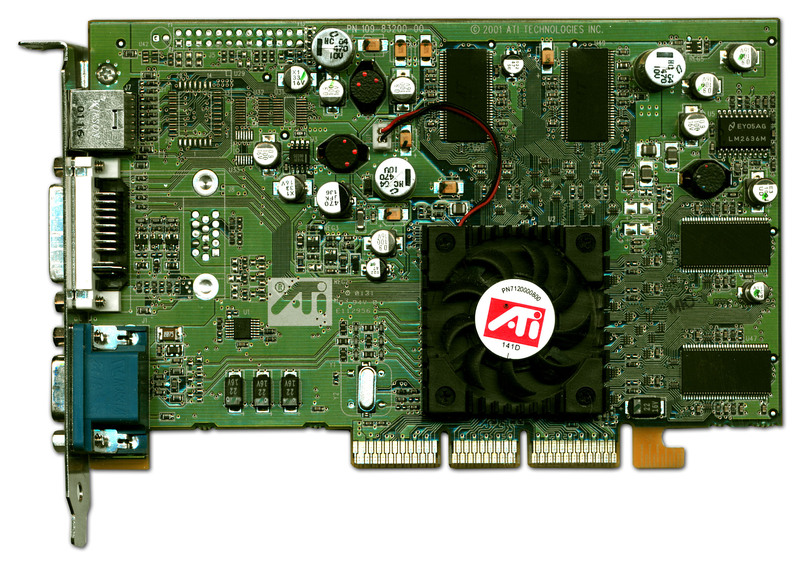 ATI drivers v6.343 (CATALYST 3.4). VSync off in drivers, texture compression off in applications. 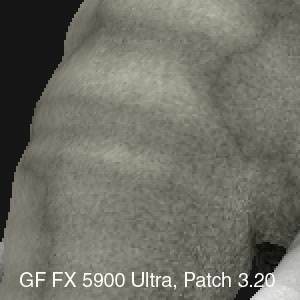 Texture detail set to High Quality. 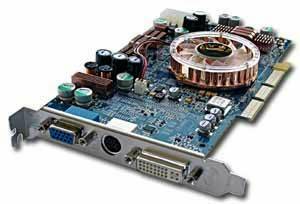 The RADEON 7500 was purposely redesigned. 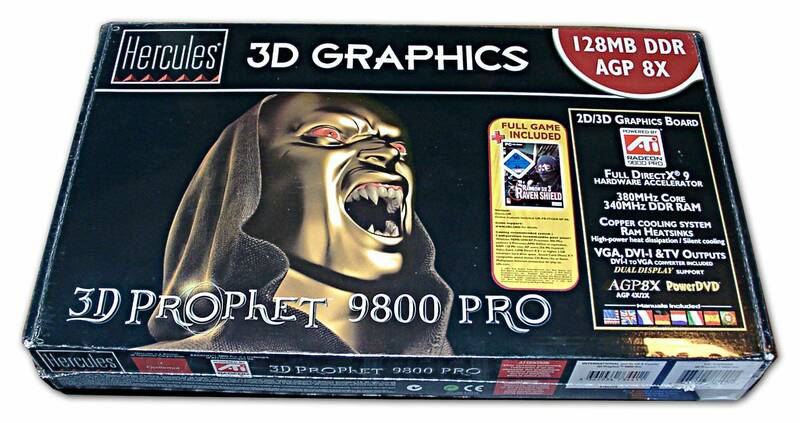 This product has excellent graphics quality for a 2D product. It's a rear picture at $50. Add the capabilities of two integrated RAMDACs of 350 MHz, and the HydraVision technology with the multi-monitor and multi-desktop support. 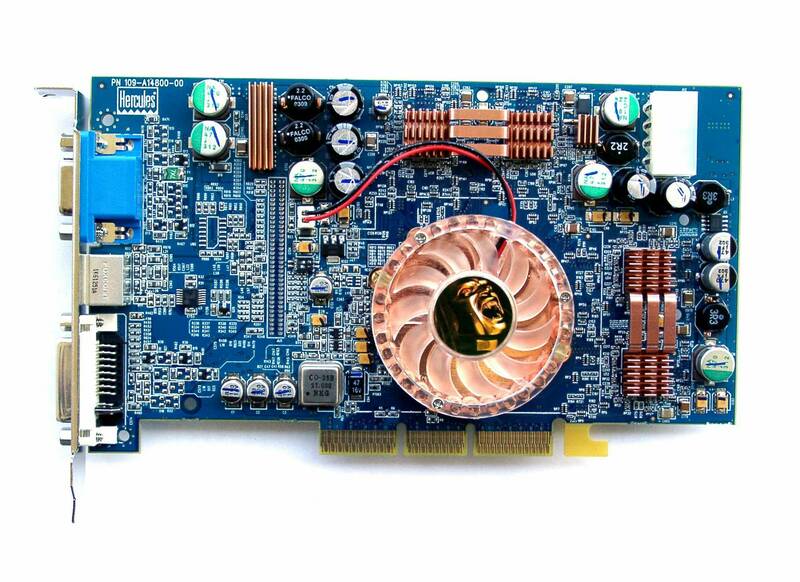 But we have written about all that in the previous reviews of cards based on this GPU. 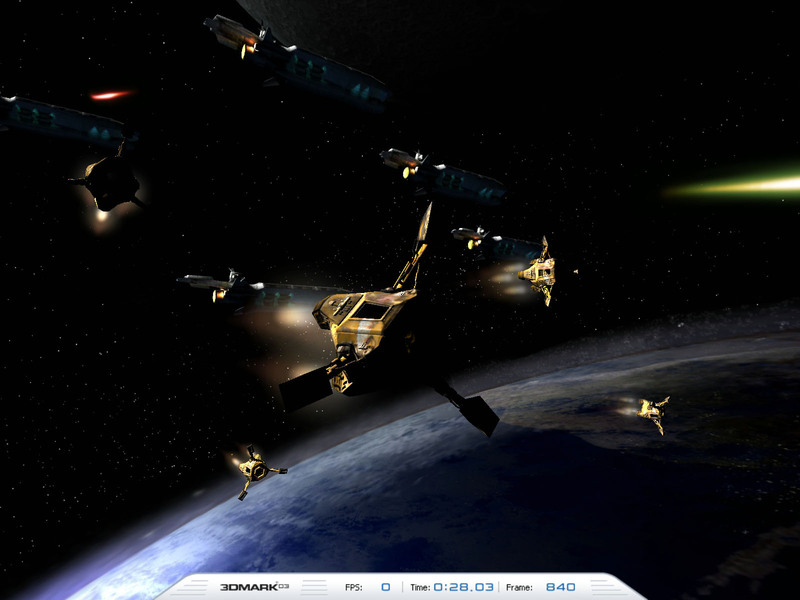 The scandal flared up recently around 3DMark03 involves NVIDIA, the developer of FutureMark and ATI. It started when FutureMark published the results of the audit of the new NVIDIA Detonator FX driver in 3DMark03 on the NVIDIA GeForce FX 5900 Ultra card. 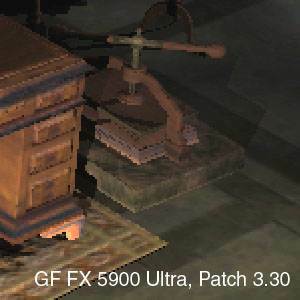 Futuremark's audit revealed cheats in NVIDIA Detonator FX 44.03 and 43.51 WHQL drivers. 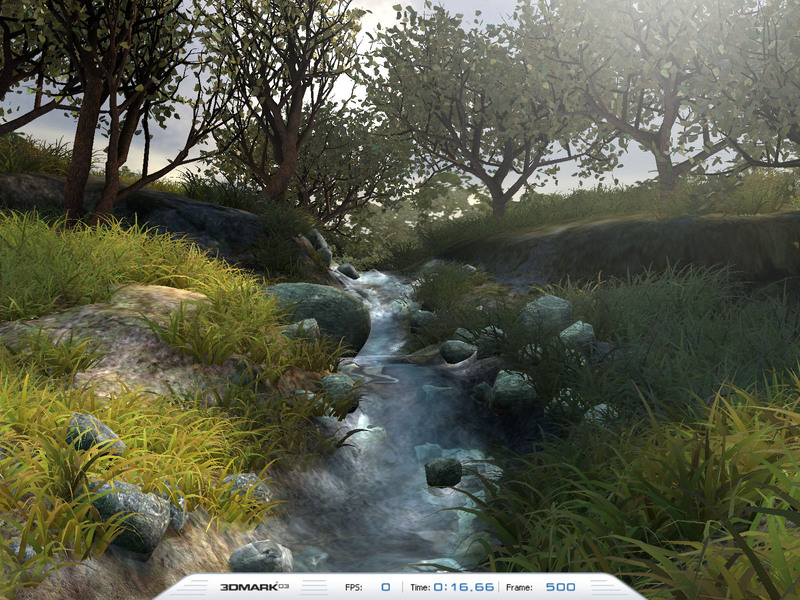 A vertex shader used in game test 4 (M_HDRsky.vsh) is detected. 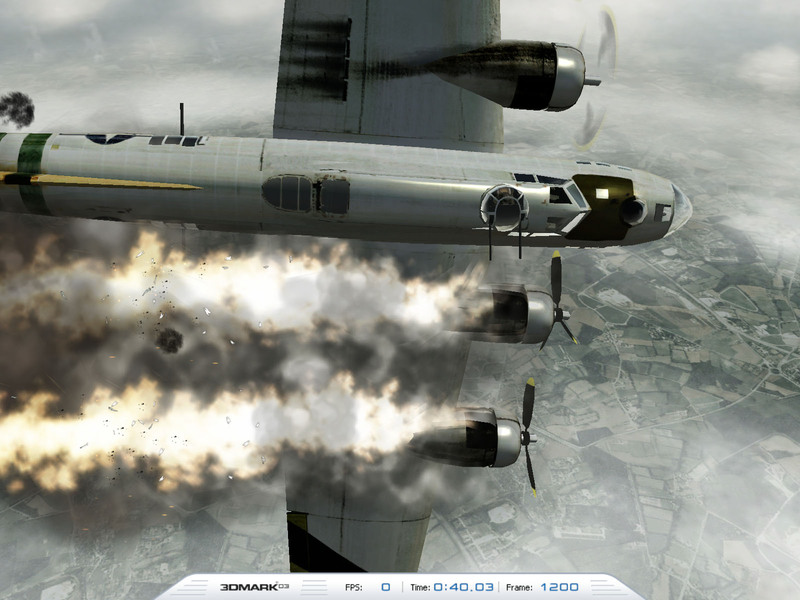 In this case the driver adds two static clipping planes to reduce the workload... This cheat was introduced in the 43.51 drivers as far as we know. A vertex shader (G_MetalCubeLit.vsh) is detected in game test 1. 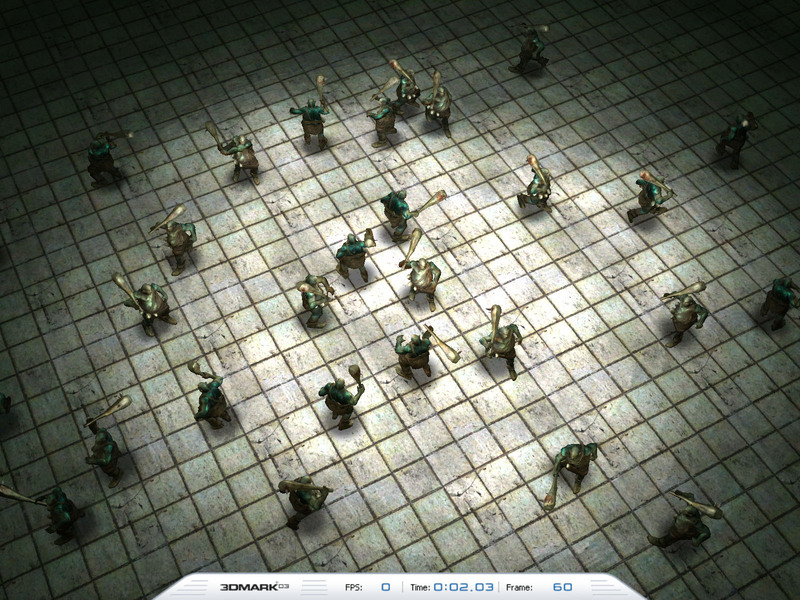 Preventing this detection proved to reduce the frame rate with these drivers, but we have not yet determined the cause. 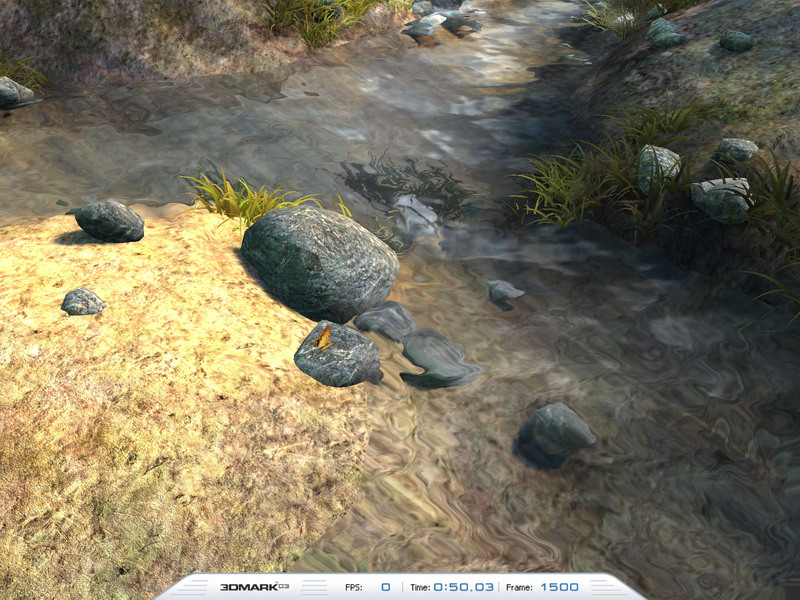 The vertex and pixel shaders used in the 3DMark03 feature tests are also detected by the driver. 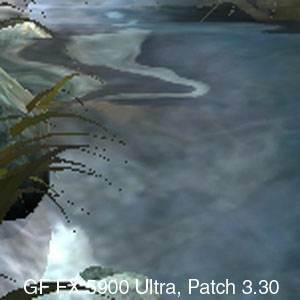 When we prevented this detection, the performance dropped by more than a factor of two in the 2.0 pixel shader test. ATI was also accused of some cheats but they were not so strong. All details of the optimizations and the methods of their prevention are given in the document above. We decided to check whether the quality drop of the NVIDIA GeForce FX 5900 and RADEON 9800 on 3DMark03 v3.20 is really so bad. At that same time we will clear up how much the speed falls down on the version 3.30, where these optimizations are traced. 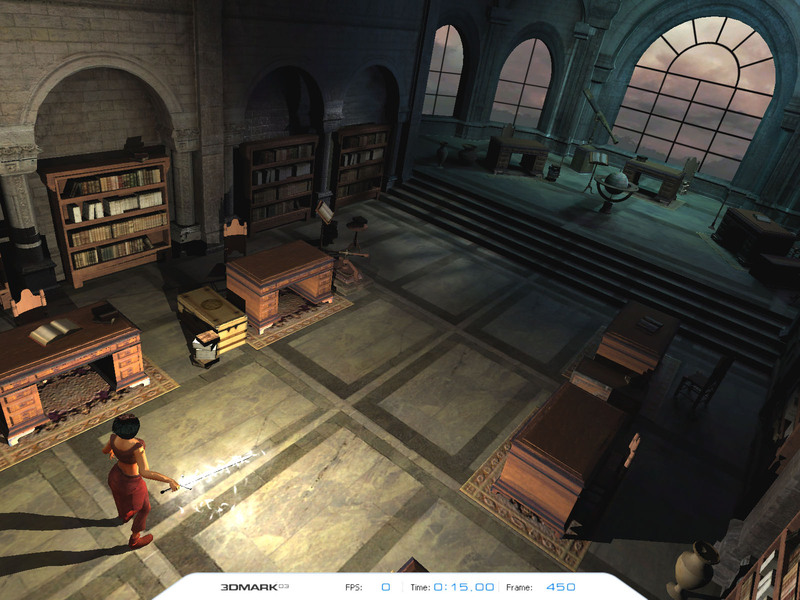 Finally, we will try to find out whether the 3DMark03 really lost its authority. 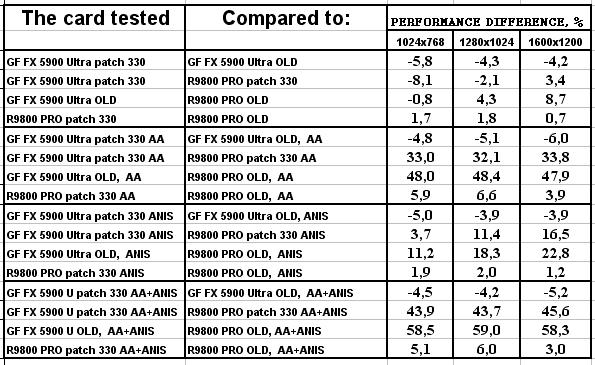 Its objectivity does look doubtful because it's clear that the test can be manipulated, because it was originally adjusted for ATI's cards supporting pixel shaders 1.4 (RADEON 8500/9000/9100/9200/9500/9700/9800 and GeForce FX5200/5600/5800/5900 can fulfill many tests in two passes, while all the rest cards do it in 4 passes), because 3DMark03 was originally meant to play up to 10-12% of accelerators, and the other part of them was in not so promising conditions. 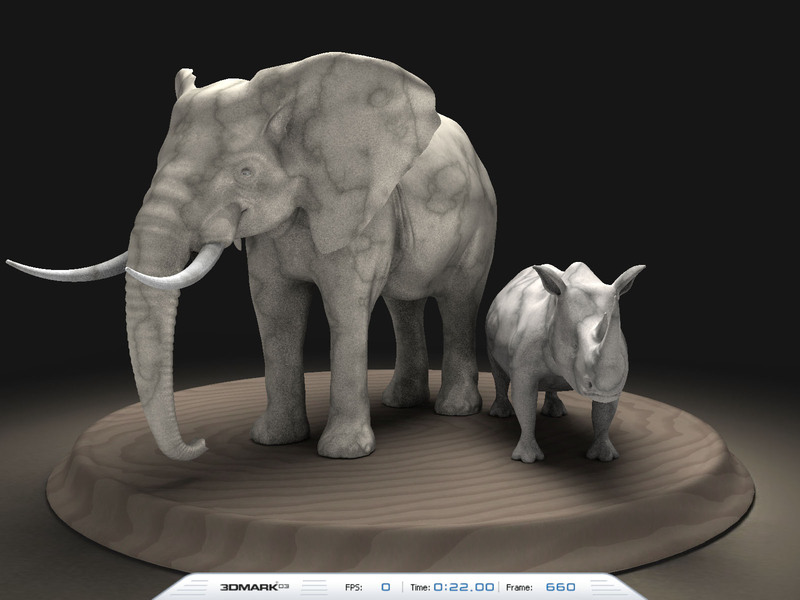 But we keep on using this test as the 3DMark is very popular. And even if we find out that the benchmark is not fully objective, we will keep on using this packet but without analysis of the scores. It should be explained that it's not because FutureMark wanted a lot of money for the beta testing and NVIDIA left the rows of beta-testers damaging relations with the test developers. 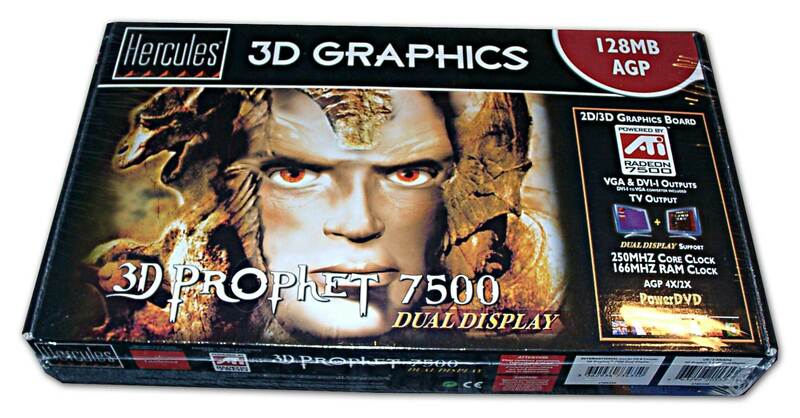 And it's not FutureMark's revenge for such behavior of the leading GPU maker (if it takes place at all!). The most important fact is that NVIDIA will keep on making optimizations and the test developers will have to patch it time and again. What results are trustworthy? Can you be sure that with a given patch and given drivers the NVIDIA cards' results will be objective? I can't. It also concerns ATI. 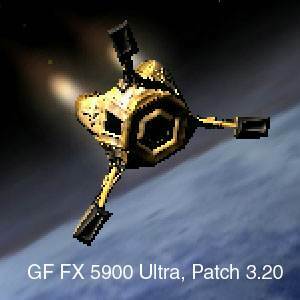 Although the company admitted that the drivers had optimizations for the 3DMark03 and promised to remove them in the next version, no one guarantees that it won't happen again. The reputation of the 3DMark03 is spoiled by the scandal and by the fact that the test developers preferred to exhibit arrogance to normal collaboration with all chip makers. Let's get back on track. I have carefully examined operation of two cards: RADEON 9800 PRO and GeForce FX 5900 Ultra, as competitors, in 3DMark03 v3.20 and in v3.30 after the last scandalous patch. Instead of performance diagrams below are the tables demonstrating the percentage ratios. 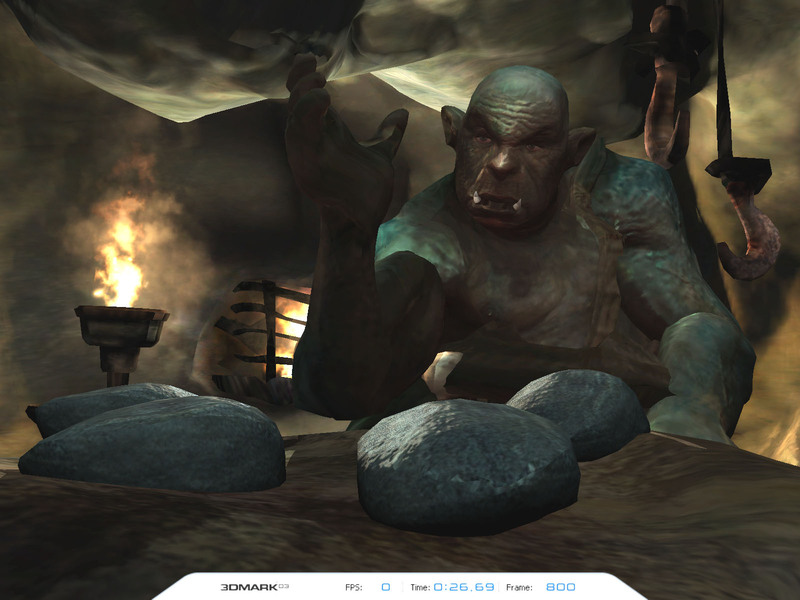 The suffix "OLD" marks the previous version of 3DMark03 - 3.20. 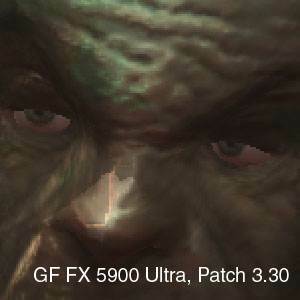 Obviously, NVIDIA made certain optimizations in the drivers v44.03. Is such quality loss adequate to the penalty of 20-23%? It's possible. Note that the speed of the RADEON 9800 PRO has dropped as well after the patch 3.30, though the CATALYST 3.4 doesn't worsen quality in this test. So, if quality losses are unnoticeable why to punish by bringing the speed down? Maybe the test developers feel hurt by the fact that ATI outdid them, but everyone must remember that an ultimate aim of any game and test is to make the image as good as possible. It doesn't matter much if there are any optimizations or tricks. A user sees the same picture irregardless of the speed. 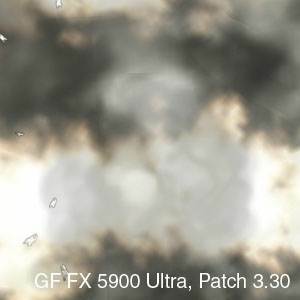 The test developers affirm that the NV35 shows snow instead of the dark sky on the beta version of this test. Once again, if users have a perfect sky on their screens on the retail version of the test, then they do not care how some or other programmers make their optimizations. We can see no difference in quality between the versions 3.20 and 3.30 in case of the NV35 and RADEON 9800 PRO. But the NV35 has lost 10-13%, while the R350 has spun up. It looks strange, doesn't it? By the way, have a look at the artifacts when the RADEON 9800 PRO renders the space ship. There is no difference in quality between the patches of both cards again. And again FutureMark finds something invisible for an ordinary user, which makes the NV35 speed down and the R350 speed up. By the way, the latter has some artifacts again. Like in Game1, it's well seen that NVIDIA tries to raise the speed when rendering the water surface. Well, such tricks deserve punishment. Is the penalty of -50% fair in this test for NV35? I don't think so. Taking into account that water is displayed only 1/5 of the overall test time, , -50% is too much. The RADEON 9800 PRO doesn't suffer or gain from this patch. 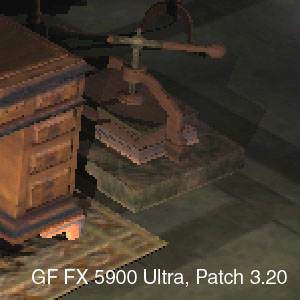 Yet my colleague from F-Center noticed that the GeForce FX 5800 became three times as fast in this test after the v43.51. They simply found the ways of optimization for this test. Again without quality losses. Obviously, the programmers at NVIDIA use some cheats in the 3DMark03 test, first of all in Game1 and Game4. Whatever the test and no matter how a given company relates to the test, it's bad to accelerate cards at the expense of the image quality, and it must be punished. We have noticed no quality losses in case of the RADEON 9800 PRO on v3.20, that is why it's hard to say what the test developers accused ATI of. But ATI admitted cheating, and there must be something. But these tricks are unnoticeable (though they correspond to those several percents in speed ATI is accused of). It's just strange that in some tests the new patch v3.30 lifted up the speed of the RADEON 9800 PRO on those drivers. From the standpoint of an average user, so considerable speed drop of the NV35 is not adequate to the NVIDIA's cheats and tricks. Especially, in Game2, Game3 and Game4. In the first two games we noticed no cheats at all. In the Game4 the speed drop by 50 % is a too cruel punishment for the tricks with rendering of the water surface. Certainly, we have no right to consider our standpoint the only true because the test developers can find some other cheats which are not noticeable but which can have a great effect on the scene. But still, if the programmers at ATI or NVIDIA have made some optimizations which do not affect the visual quality, then why not? Why to have a grudge if the FutureMark developers couldn't make some optimizations and others could? I feel very disappointed at such situation around 3DMark03 and FutureMark, I can't believe that the patch 3.30 "has put everything back on track", and I can't believe that future patches will objectively reflect hardware capabilities instead of emotions. That is why all our future tests (except of the RADEON 9600 PRO which was tested before this article) will use 3DMark03 but just for the sake of statistics, without comments and analysis. Overclocked cards are marked red, clock speeds follow 'o/c' sign. All I wanted to say about the 3Dmark03 is said above. The Hercules 3D Prophet 9800 PRO card is the most powerful accelerator at $450. 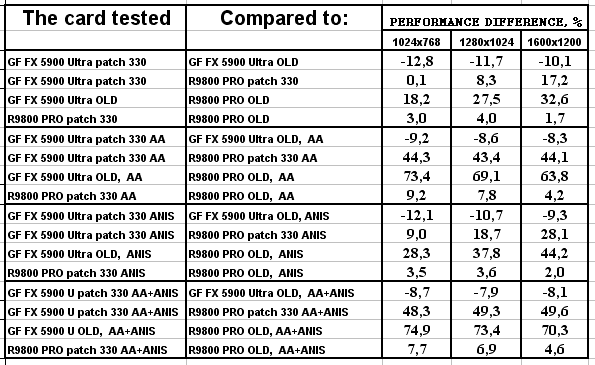 The tests show that the RADEON 9800 PRO has the fastest shaders 2.0, that is why this card has perfect prospects in future games! 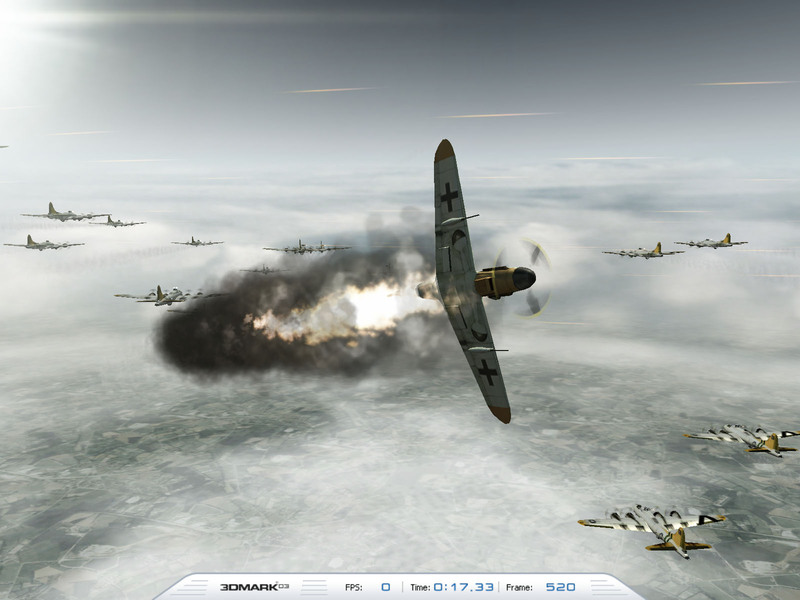 The overall performance is also high. But the cards are very expensive now because they have just appeared on the market. 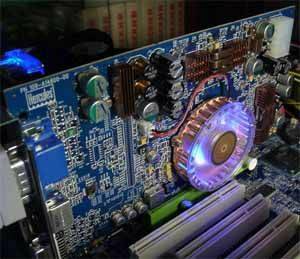 The card itself, its design, the backlit cooler make this RADEON 9800 PRO based card very attractive! I really like it! Certainly, such accelerators are not affordable for everyone. 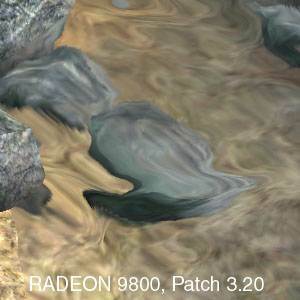 And if you have RADEON 9700 PRO or even GeForce FX 5800, it makes no sense to replace them with RADEON 9800 PRO or NV35. At least, today. Now a bit on the RADEON 7500. 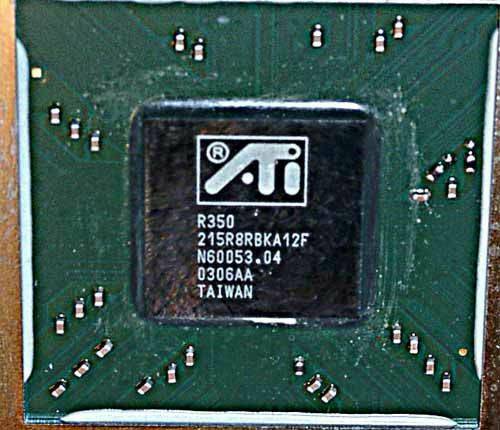 It's really interesting how the company managed to find the application for this obsolete chip. 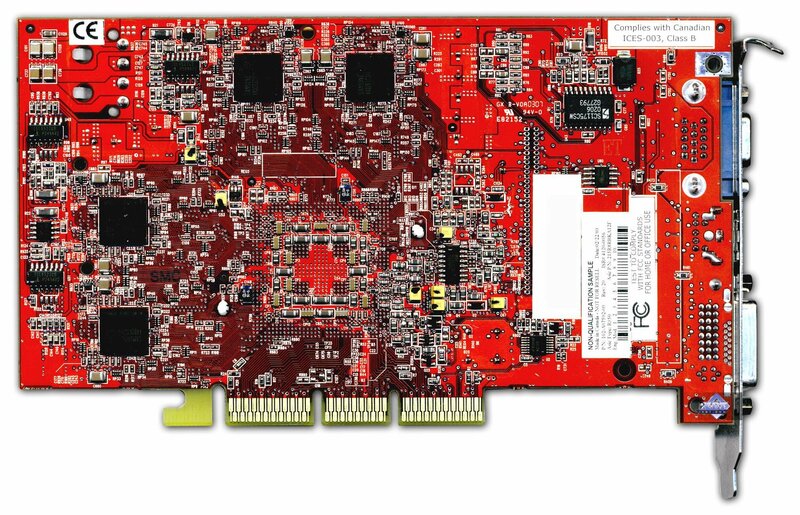 Not so long ago this GPU was a middle-end 3D accelerators, and even today its 3D features looks good, but its speed is at the Low-End 3D level. 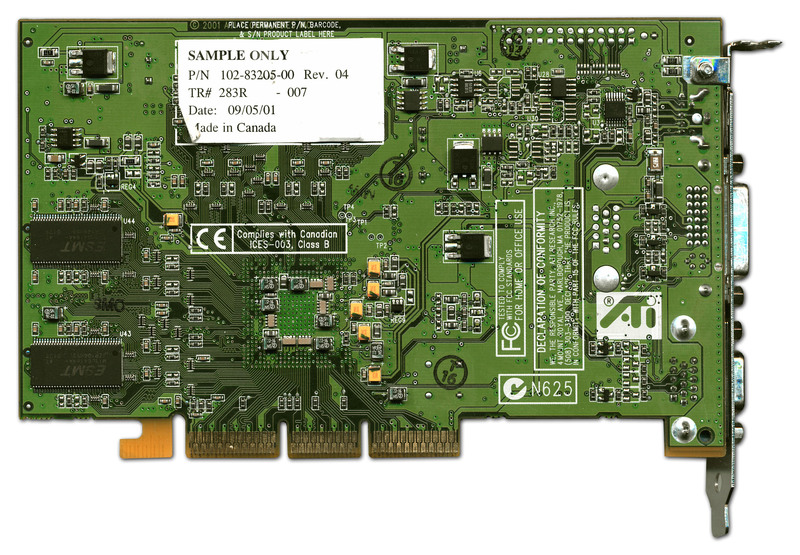 The card is very cheap thanks to the SDR memory instead of DDR (2D quality has improved much at that). Overpriced (even for the High-End sector).